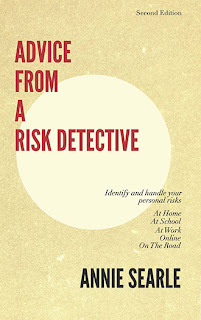 Advice From A Risk Detective: A tipping point? As I teach my second class this week, I realize how very focused I have been on two global issues, each of which has their own consequences from a risk perspective. Many of you have been reading me on Ebola risk since last spring. Though it does appear that the rapid mutation and growth of cases has caught the attention of the world stage, we are still a month or so away from seeing the actual deployment that result from commitments from the private sector (The Gates Foundation $50 million; Paul Allen $4 million, for example); and from both governmental organizations and world health organizations often funded with a mix of public and private sector funds. This morning's New York Times story on home deaths in Monrovia, Liberia, is just one more illustration of far away from our comprehension such a human situation is. All I am able to do is monitor the modeling that is now being done by research teams on how and where the virus will spread. I understand that not more attention is being paid because terrorist threats from ISIL (The Islamist State) have risen to such a level that the United States once again finds itself leading an effort to push back against a cultural and religious landscape it doesn't understand. This is especially the case now that ISIL is using social media to make its brutal points, as it continues to behead unbelievers on camera. Watching the Ken Burns series called "The Roosevelts" last week caused me to reflect on how little either Teddy or FDR would have been able to accomplish today, with every moment, every gesture, every inflection studied of our leaders is analyzed into the ground. FDR, for example, was able to prepare Americans for a war they initially did not want through the effective use of his "fireside chats." When it was suggested after his first broadcast that he do them more often, he replied that their effectiveness would lie in them not being too frequent. Ultimately he made 30 such talks over 11 years, covering both the Great Depression and World War II. Today President Obama is in an entirely different place and time: social media records every gesture, microphones pick up even private conversations, and not much is any longer considered confidential. He faces a passive aggressive Congress and election year votes that may change the very composition of the Congress, conveniently on a long break until after those elections. To his credit, the president is leading as he always has wanted to lead: in the presence of other nations who also have a stake in the outcome. To see both a Saudi prince and a Saudi woman piloting missions today is another sign of how things are evolving. I'm keeping an eye on all of it, and have the rare privilege of being able to talk about these matters with my students as part of understanding the checks and balances that make up our system of government. We use three lenses on such current topics: ethics, policy, and law, especially when influenced by the evolution of technology.